Funded by the and NASA, UF aerospace engineers have built prototypes of 6-inch- to 2-foot- drones capable of squeezing in and out of tight spots in cities — like tiny urban stunt planes. 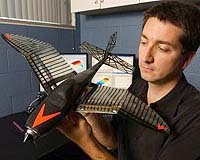 Their secret: seagull-inspired wings that “morph,” or change shape, dramatically during flight, transforming the planes’ stability and agility at the touch of a button on the operator’s remote control. The latest version, built by mechanical and aerospace engineering doctoral student Mujahid Abdulrahim,Impressed by seagulls’ ability to hover, dive and climb rapidly, Abdulrahim photographed the gulls close-up during flight. The images showed the gulls’ wings flexing at both their shoulder and elbow joints as they altered flight patterns. Abdulrahim added this ability in the new prototype, with promising results. With the wings mimicking the gulls’ elbow in the down position, the plane loses stability but becomes highly maneuverable. With the wings in the elbow straight position, it glides well. And with the wings in the elbow up position, it’s highly controllable and easy to land.